the ropemakers' bastion is in the middle of the south-eastern side of the brasov medieval walls and was mention in a document in 1416 . used to be 12 m high in a hexagonal form . it was almost destroyed in a fire in 1689 but rebuilt . the house inside was built in 1794 .
more walls on the eastern side . on this side there used to be 8 towers and 3 bastions . 2 of the towers are still standing . we're moving north on the east side with the walls facing the tâmpa mountain . on this side there are 3 sports complexes and 2 playing grounds . and a lot of places to rest and relax with a great view . 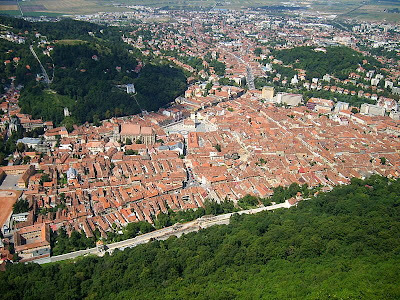 we will make a tour of the medieval fortification of brasov (check the map from yesterdays post) . walls , bastions , towers ... old rocks . 500 years ago these were some powerful defensive weapons . i don't think they saw much "action" but this was the point , to scare away the enemies . 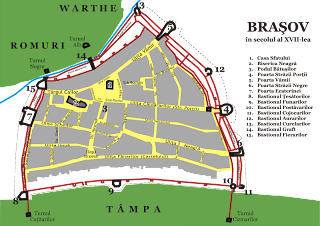 still , some parts were beaten but another kind of enemy : time ....ok , let's start with the "bastionul tesatorilor " = linen weavers bastion on the southern corner . 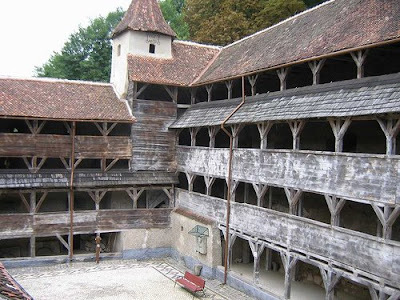 today a museum that can be visited on the way up on tampa mountain , it is the largest medieval bastion in brasov and the best preserved among the seven initial watchtowers built around the city walls. it was first built during 1421-1436 and rebuilt in 1570-1573. inside the construction there are three main protective corridors. The wooden galleries surround a small central square. a good view of the old town from the tâmpa mountain . you can see that it is very clearly delimitated and used to be surrounded by fortifications , a huge defence wall which is still standing today on two sides the ones with the hills where the development of the city didn't ask for demolitions . in the recent years the walls , the towers , the monuments were renovated and at least we know they'll have a longer life . 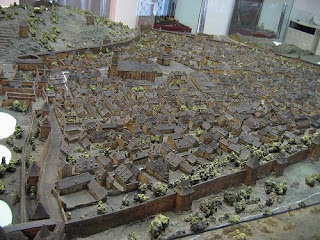 the map and the model (at the history museum in the old council house - the one in the middle of the square) shows how the old brasov and the defence system looked like a few hundreds years ago . this is the old council square from the belvedere point . this square was the center of the old town brasov and it still is the most important place nowadays . this one is taken from the old council square so you can see layers of old architecture . "the black tower" (yes , i know it's white but there is another tower called the white tower) was erected between 1460-1494. It has a semicircular shape and it is 14m high. strange weather today . very warm for december and windy . really windy . 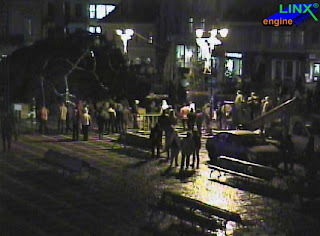 so windy that the christmas tree in the old council square which is 29 m high fell down . i didn't see it but i heard on the news . in 2 days we have the official opening for the holidays season with the light up so i hope they will fix it till then . fortunately nobody got hurt . update : yes , the tree is down . so sad ... and i don't think they can fix it in time for saturday because i understand that it's broken . today is the national day of romania ... so , happy anniversary romania ! this is the church (st michael and gabriel) were they keep the relics until december 5th .